See motocyclist on tie going to work honorably. See the vehicles lined responsibly? Nigeria was once a sane country. Can the British colonize us all over again? I can't see any hawker or irritating Latsma. There was no road safety then. Where did we go wrong? To think this was Nigeria at some point. God have mercy in Jesus name. Ame. I wish our independence was in 2017 or thereabout. When our country is still sane..
Abi o, we really need the British to colonize us again. See road organise like Uk. Can we just have the British back? Look at orderliness!! 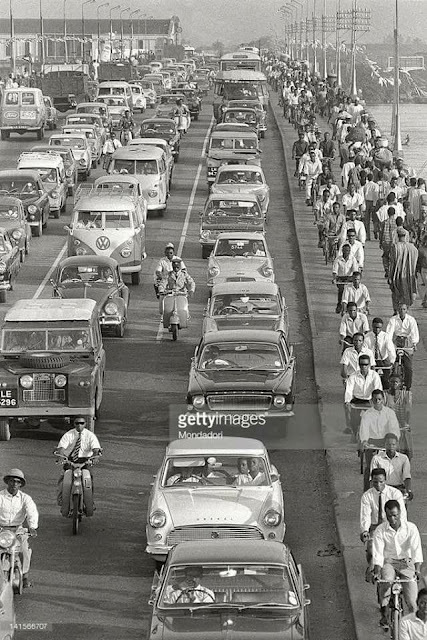 You see those cyclist outside the Bicycle line were the men that gave birth to the unrulling sons of Jezebel Nigerians of today, they always fallout sha nii ! @alternative facts that electricity own eh! Crazy! See people happily walking, no wonder our fathers are stronger in their days compare to now.